Ohio public colleges also have another interesting advantage. The state has a healthy blend of metropolitan areas and countryside from Lake Erie to the bluegrass plains along the Ohio River. So whatever your fondness, Ohio public colleges and universities can find ways to help you with career training and degree programs in fields like business, health care and technology. If you are a somebody who requires big-city enjoyment, Cleveland, Cincinnati, Columbus, and nearby Pittsburgh or Philadelphia can satisfy your every desire. If you go for the great outdoors, Ohio has room to spare. Looking for an Ohio Public College? The state of Ohio is the home of a number of public and private institutions of higher learning. Chartered in 1787, Ohio University was the first institution of higher education chartered by an act of Congress in America (Northwest Ordinance), the first university in the former Northwest Territory in 1804, and is the ninth oldest public university in the United States. Eleven of the 13 public universities top the state's enrollment statistics, with The Ohio State University ranking as one of the nation's top five universities by enrollment. The remaining two public institutions - Shawnee State University and Central State University- are relatively small. The Ohio Board of Regents was created in 1963 by the General Assembly oversees the public institutions of higher education in Ohio. The system is home to the Ohio State University, one of the largest universities in the United States. Several of the schools in the University System of Ohio have been call 'public ivy', a designation describing academic equivalence with Ivy League institutions. Of the public colleges and universities in Ohio, the most popular being Ohio State University. 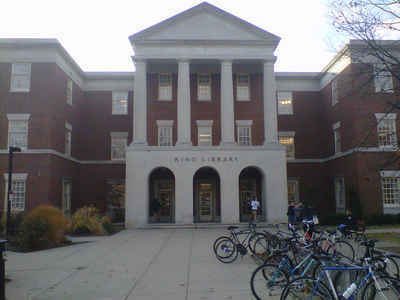 Miami University Oxford is the most expensive public school in Ohio. In Ohio, online degree programs are offered in state of the art distance learning programs and online colleges available to any qualified student. ; Ohio ranks 40th out of the 50 states in percentage of people with a bachelor's degree. Find the right program for yourself and get started today.